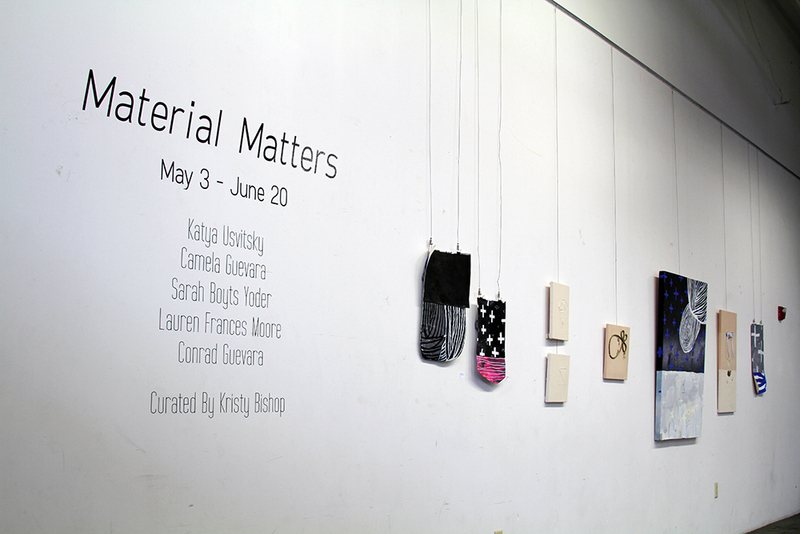 Earlier this summer I was lucky enough to participate in Material Matters, an exhibition curated by Kristy Bishop, at North Charleston’s Ten Storehouse Row. 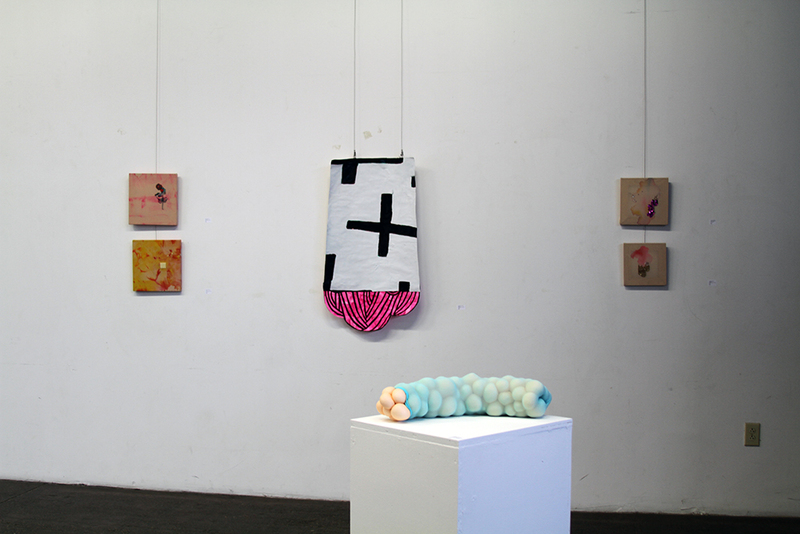 The show combined works by Katya Usvitsky, Sarah Boyts Yoder, Lauren Frances Moore, Conrad Guevara, & myself, centered on the transformation of mundane materials. 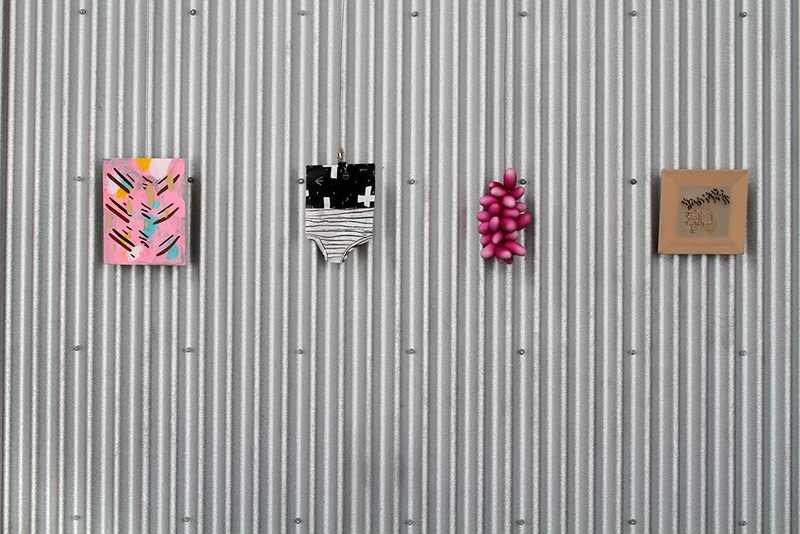 Pictured are smaller works in the front of the multi-use workspace. From left to right: Conrad Guevara, Sarah Boyts Yoder, Katya Usvitsky, & Camela Guevara. 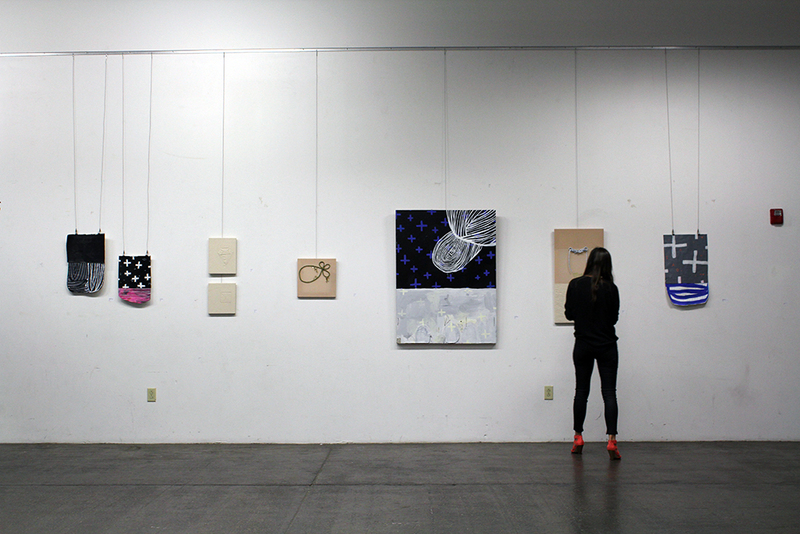 Sarah Boyts Yoder’s work & my own were featured on the main walls of the non-traditional gallery space. Yoder uses paint & paper to create richly textural mixed media collages with restrained color palettes, save for vibrant flashes of fuchsia or cobalt. 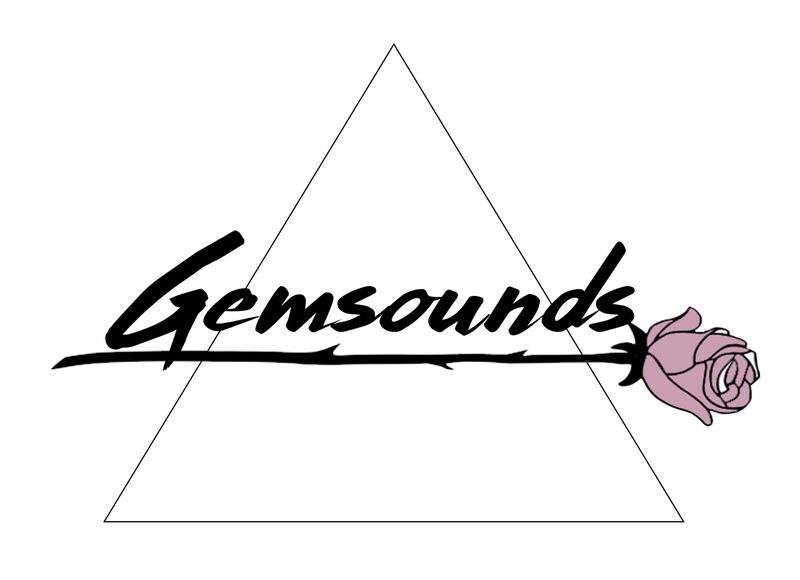 Our use of geometric shapes & two-dimensional format were highlighted by their proximity. Katya’s work exhibits themes of femininity & motherhood through the use of opulently-dyed pantyhose to create otherworldly clusters of spheres. 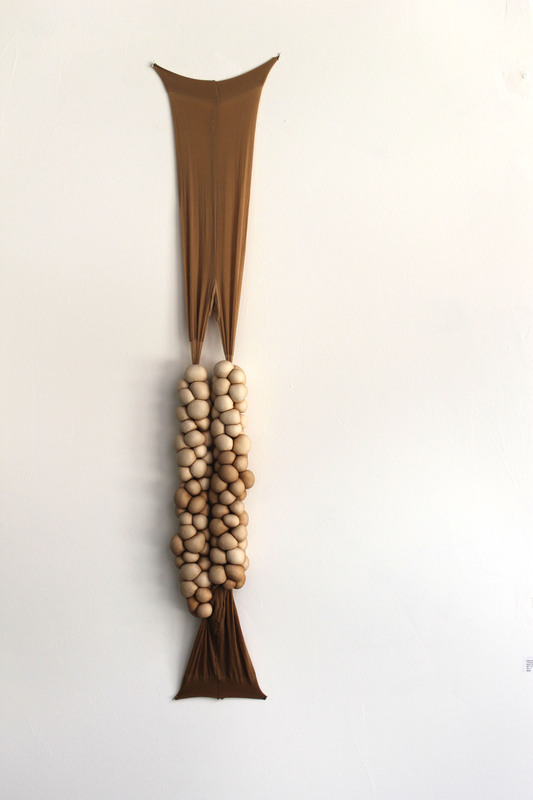 These works, being made of pantyhose, have a similar texture to my knit substrate, as well as the sum of parts that is created by her groupings of vibrant orbs, which I create by sewing beads on one by one. 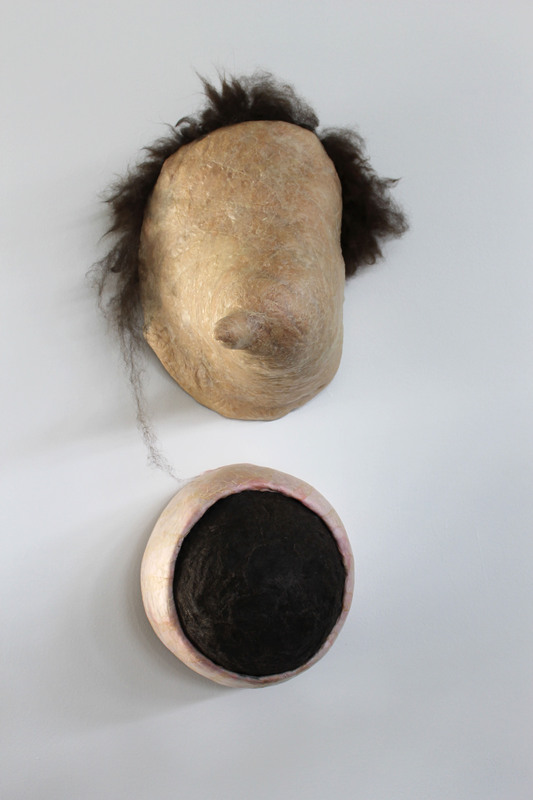 Lauren Frances Moore’s work is body-conscious, using hair extensions & eyelashes, as do her more unexpected materials like insulation foam & silicon. 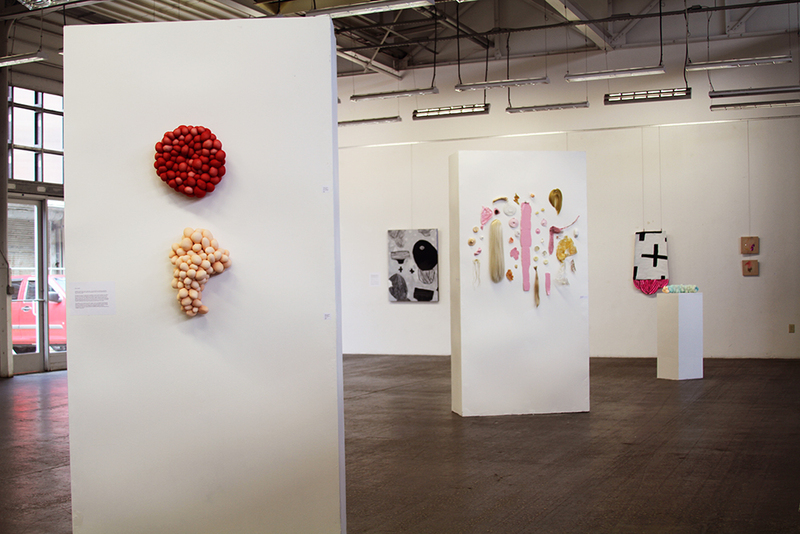 Her work explores skin & barriers between what is & isn’t. Other works employ pig intestine (don’t get crazy, if you eat sausage then you have eaten pig intestines) to create visceral, transparent veined texture in minimalist forms. 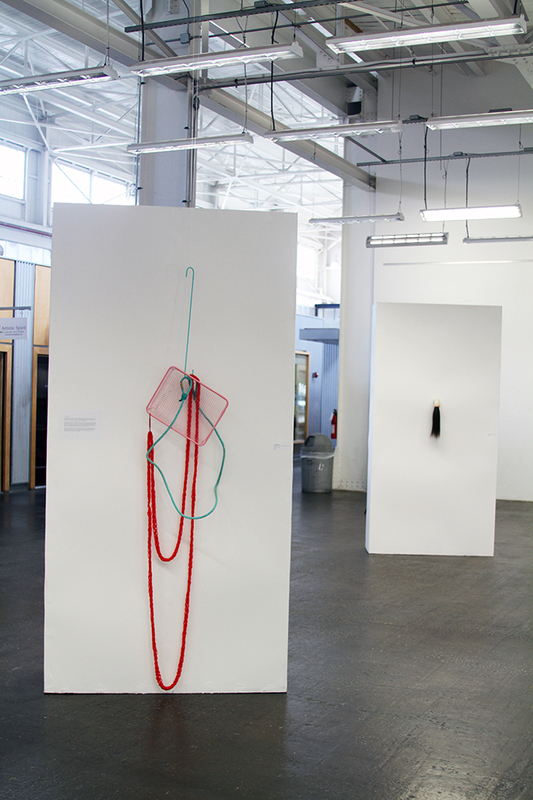 Conrad Guevara, my brother, just received his MFA from the San Francisco Art Institute. He uses found, often industrial materials & inexpensive items from Japanese dollar stores, that he imbues with his signature vibrant colors in playful combinations. Pantyhose, beads, expansion foam, paper, sequins, rope, etc. Isn’t it fun to imagine things we use on a daily basis moonlighting as works of art?